The historic Ausonius Way has been highlighted by the Hunsrück Society (association for the advancement of cultural heritage) and lengths of it can still be walked, passing by Bingen, Rheinböllen, Simmern, Kirchberg, Dill, Hochscheid, Belginum, Gräfendhron, Fell, and Trier. If you travel in 20 km stages, the entire trip would take about a week: Stage 1 Bingen-Rheinböllen (22km), Stage 2 Rheinböllen-Kirchberg (23km), Stage 3 Kirchberg-Hochscheid (17km), Stage 4 Hochscheid-Gräfendhron (22km), Stage 5 Gräfendhron-Fell (21km), and the last stage Fell-Trier (13km). 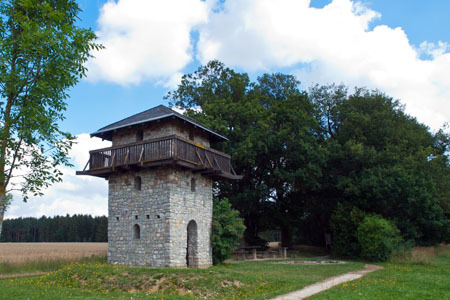 The Roman watchtower (reconstructed) shown above is on the edge of the forest above the little village of Dill, which can be seen from afar on a well maintained segment of the historic Ausonius Way. The nearby car park for hikers is a practical starting point to experience a longer part of the 2000-year-old road "under your feet". With your first steps the significance of this ancient route immediately becomes clear, for its routing is truly an impressive choice. So the hiker literally senses the thousand-year-old history of the region passing by under his feet. After returning to the starting point, you should not miss paying a visit to the small village of Dill, for it offers an interesting church and an imposing castle from 1107. This castle came into the possession of the Counts of Sponheim, slightly later, but it was never of great military importance. Dill lies within a small loop of the Dill creek somewhat off to the side of the Hunsrück Heights Road ("Hunsrückhöhenstraße"), about 5km west of Kirchberg. But it is not only the Roman street and its fortifications that bear witness to the centuries of Roman presence in the Hunsrück. You can come across completely different, surprising things here -as happened 10 years ago nearby the Lauschenhütte above Stromberg. Here, in the dense forest, someone found a mound containing the remains of a Roman building from the 2nd-3rd century A.D with clay floor, holes for amphorae and a bricked fireplace. Size and form of the building, as well as the special roof construction, indicated that it was used as storage space or servant house of an agricultural company. So an estate, possibly quite large, is still somewhere nearby, hidden under one of the many mounds of the region.